The properties of beeswax make it an excellent medium for preparing figures and models, either by modeling or by casting in molds. It can easily be cut and shaped at room temperature, melts at a low temperature, mixes with any coloring matter, takes surface tints well, and its texture and consistency may be modified by the addition of earthy matters and oils or fats. When molten, it is highly responsive to impressions from a mold and, once it sets and hardens, its form is relatively resilient against ordinary temperature variations, even when it is cast in thin laminae. These properties have seen wax used for modelling since the Middle Ages and there is testimony for it having been used for making masks (particularly death masks) in ancient Rome. The death masks of illustrious ancestors would be displayed by the elite holding the right of "ius imaginem." The cost of making a wax sculpture can be between USD150,000 and 300,000. The display of temporary or permanent effigies in wax and other media of the deceased was a common part of the funeral ceremonies of very important people in European historical times. Most of the figures would wear the real clothes of the deceased so they could be made quickly. The museum of Westminster Abbey has a collection of British royal wax effigies, as well as those of figures such as the naval hero Horatio Nelson, and Frances Stewart, Duchess of Richmond, who also had her parrot stuffed and displayed. The effigy of Charles II of England (1680) was displayed over his tomb until the early 19th century, when all were removed from the abbey itself. Nelson's effigy was a pure tourist attraction, commissioned the year after his death in 1805, and his burial in St Paul's Cathedral after a government decision that major public figures should in future be buried there. Concerned for their revenue from visitors, the Abbey decided it needed a rival attraction for admirers of Nelson. 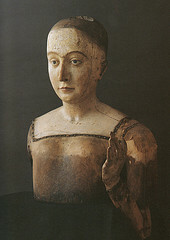 The practice of wax modelling can be traced through the Middle Ages, when votive offerings of wax figures were made to churches. The memory and lineaments of monarchs and great personages were preserved by means of wax masks. During this period, superstition found expression in the formation of wax images of hated persons, into which long pins were thrust, in the confident expectation that thereby deadly injury would be induced to the person represented. This practice was considered more effective when some portion of the victim's hair or nails were added to the wax figure, thus strengthening the connection with its actual subject. This belief and practice continued until the 17th century, though the superstition survived into the 19th century. In the Scottish Highlands, a clay model of an enemy was found in a stream in 1885, having been placed there in the belief that, as the clay was washed away, so would the health of the hated one decline. During the Italian Renaissance, modeling in wax took a position of high importance, and it was practised by some of the greatest of the early masters. The bronze medallions of Pisanello and of the other famous medalists owe their value to the properties of wax: all early bronzes and metalwork were cast from wax models first. There are a number of very high quality wax figures from the 16th and 17th centuries, mostly portrait figures and religious or mythological scenes, often with many figures. Antonio Abondio (1538–91) pioneered the coloured wax portrait miniature in relief, working mainly for the Habsburg and other courts of Northern Europe, and his son Alessandro continued in his footsteps. Towards the close of the 18th century, modeling of medallion portraits and of relief groups, the latter frequently polychromatic, was in considerable vogue throughout Europe. Many of the artists were women. John Flaxman executed in wax many portraits and other relief figures which Josiah Wedgwood translated into pottery for his Jasperware. The National Portrait Gallery has 40 wax portraits, mostly from this period. The famous wax bust attributed to Leonardo da Vinci acquired in 1909 by the Museum of Berlin is the work of an English forger who worked about 1840. The wax model of a head, at the Wicar Museum at Lille, belongs probably to the school of Canova, which robs it of none of its exquisite grace. Wax-works, not intended as fine art, subsequently became popular attractions, consisting principally of images of historical or notorious personages, made up of waxen masks on lay figures in which sometimes mechanism is fitted to give motion to the figure. Such an exhibition of wax-works with mechanical motions was shown in Germany early in the eighteenth century. The most famous modern waxwork exhibition is that of Madame Tussauds, where the technology of animatronics brings the wax figures to life. Waxworks are frequently made presented by contemporary artists who take advantage of its lifelike and uncanny qualities. While the artist often creates a wax self-portrait, there are examples too of imaginary personalities and historical personae. For example, Gavin Turk had his portrait made as Sid Vicious ("Pop", Waxwork in vitrine 279 x 115 x 115 cm, 1993), Jan Fabre as a notorious thief (homage to Jacques Mesrine (Bust) II, 2008. Lifesize. Private collection.ta.) Contemporary artists working with wax include Beth B, Berlinde de Bruyckere, Maurizio Cattelan, Peta Coyne, Eleanor Crook, Robert Gober, John Isaacs, Wendy Mayer, Pascale Pollier, Chantal Pollier, Sigrid Sarda, Gil Shachar and Kiki Smith. Techniques include body casting using alginate and silicone rubber moulds, and hand modelling which creates unique forms and distortions. The museum of medieval torture instruments in Amsterdam also used wax figures in order to demonstrate the use of machines and tools of their display. A wax museum or waxworks consists of a collection of wax figures representing famous people from history and contemporary personalities exhibited in lifelike poses. Wax museums often have a special section dubbed the "chamber of horrors" in which the more grisly exhibits are displayed. Wax figure of Romy Schneider as Elisabeth of Bavaria (Sissi) at Panoptikum Hamburg. Wax figure of Cats (musical) at Panoptikum Hamburg. ^ a b c d Originally appearing in Volume V28, Page 430 of the 1911 Encyclopædia Britannica. ^ "Funerals in Ancient Rome". Mariamilani.com. Retrieved 2013-04-22. ^ "Madame Tussauds Interactive Wax Attraction - Madame Tussauds Interactive Wax Attraction Las Vegas - Vegas Attractions". VEGAS.com. Retrieved 2013-04-22. ^ "Cost of making a wax sculpture". Mmajunkie.com. 2010-05-28. Retrieved 2013-04-22. ^ Gillet, Louis. "Leonardo da Vinci." The Catholic Encyclopedia. Vol. 15. New York: Robert Appleton Company, 1912. 27 Jun. 2009 <http://www.newadvent.org/cathen/15440a.htm>. Wikimedia Commons has media related to Waxworks (plastic arts). This article incorporates text from a publication now in the public domain: Chisholm, Hugh, ed. (1911). "Wax Figures" . Encyclopædia Britannica. 28 (11th ed.). Cambridge University Press. p. 430. This page was last edited on 2 July 2018, at 03:55 (UTC).